One Call Trade Specialist! Plumber, Electrician, Air Conditioning, Drains, TV Antenna, Appliances, Gas Fitter, Carpenter, Hot Water, Data Cabling, Energy Audits & more. 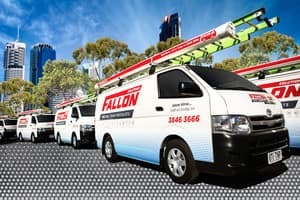 Fallon Solutions provide Electrical, Plumbing, Air Conditioning, Appliance Repair and Carpentry services across the greater Brisbane area. Our reputation is built on over 50 years of quality workmanship, timely service, and customer satisfaction. Our trades team are always up to date with the latest industry knowledge which means you are assured of the best solution to your problems. Ongoing training is provided to ensure our team is efficient, workmanship is of the highest quality and you are provided the best value for money. We know your time is valuable. Our call centre, dispatch and trade teams work closely together to optimise the booking process so that we can be there at a time that suits you. When you book a job, you will receive a job confirmation and your technician will call 15 – 30 minutes before arrival. All work is backed by a limited lifetime labour warranty and your technician will perform a complete complimentary home safety inspection before commencing work to ensure that everything is safe and working as it should. Your technician will also leave your home clean and tidy. Its great to have finally found a company that has all the tradies I need. 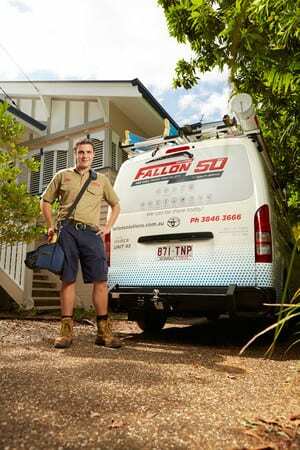 Ive used Fallon plumbing, electricians, antenna installation and Daikin air conditioning services. They have always been reliable, friendly and reasonably priced. I have peace of mind that I will have prompt service and theyve always been very accommodating to fit in with the hours I need them. I have confidently recommended Fallon to friends. Ive just discovered that they now also have a handyman service. Great! 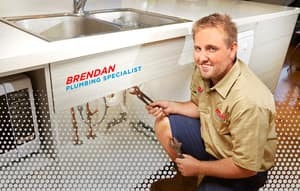 Exceptional service and response from Steve the Plumber and Joel the electrician who saved my day by replacing my broken hot water cylinder - same day in only a few hours. Steve was very patient and helped talk me through the options avaiable to me and the merits and pitfalls of each option so that I was best able to make the right decision. Steve and Joel did a brilliant job in removing and installing the new system and making sure that I inspected and was happy with the work - they were courteous and friendly and very funny. It was a genuine pleasure to have them here and I feel fortunate to have had both these guys assigned to my job. Cant thank them enough and highky recommend them. Wouldnt hesitate to use them again and to recommend them to friends and family. Thank you Steve and Joel for al your hard work and excellent craftsmanship. Hi. Thank you so much for your glowing review for both Steve and Joel. It's great to hear they both completed a great install on your new hot water system and we thank you for recommending us to others. We look forward to working with you again. Pat M serviced my air conditioner today which had a blockage. He was professional, courteous and completed the task quickly and efficiently. Hi Cathy. Thank you for your review for Pat. It's great to hear he completed a professional service on your air conditioning unit and it was completed in a timely manner. Thank you again. 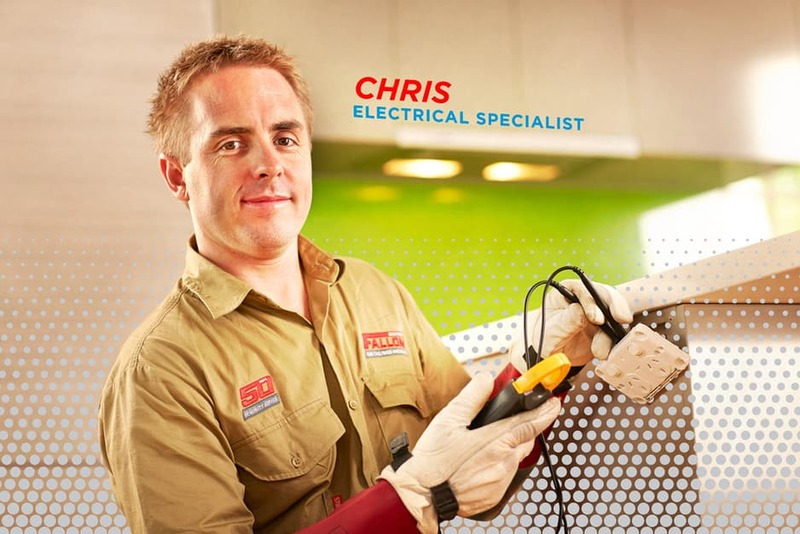 Exceptional service even with a late call-out time, Chris was able to quickly suggest a solution to out water heater unit problem. Friendly and professional, would recommend. Hi. Thank you for your review for Chris. We are glad to hear that your experience was a positive one and we thank you for recommending us to others. I started using Fallon Solutions last year for a few final touches of my renovations. Whilst the price was a little on the 'higher end', the service was impeccable and the jobs looked great. I signed on to their loyalty program and have used it to great effect. 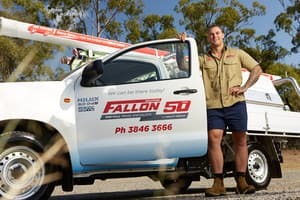 I just had a visit from one of their local tradies called Jacob for some odd jobs and he had everything done in a timely manner, was polite and understood customer service was a big part of his job. I will definitely use Fallon Solutions in the future, and would ask for Jacob to complete any future work I may need. Luke - Oxenford, Gold Coast. Hi Luke. Thank you for your awesome review! We know we're not the cheapest in the market, but we certainly make up for that by providing our customers with premium products and service. It's great to hear that Jacob completed all of the tasks in a timely manner and provided the level of customer service we strive to achieve every time! We look forward to working with you again. Excellent service by Fallon. Our air conditioning unit was badly in need of a service, and Tyson was very helpful and professional. Would recommend. Hi. Thank you for your review for Tyson. It's always good to hear when our technicians complete an excellent job and we thank you for recommending to others.